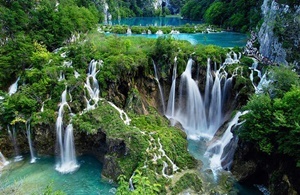 While in Croatia you should definitely visit Plitvice Lakes - the most beautiful National park of Croatia. Plitvice Lakes National Park is set around a collection of 16 lakes which are all interconnected and cascade into each other, from the highest point at 636 m to 503 m.
They are grouped together in two sets, 12 Upper Lakes and 4 Lower Lakes. There are also 2 waterfalls, the Big Falls or Veliki Slap at 78 m in the Lower Lakes, and Galovacki buk at 25 m in the Upper Lakes. The lakes act as one big water reservoir surrounded by Mt Velebit in the west which divides the coastal area from Plitvice Plateu. To the east the Plitvice Lakes are protected by Mt Pljesevica which marks the border with Bosnia and Herzegovina. Croatia has invested a huge amount of money into the infrastructure of the National Park and the roads there are excellent, so Plitvice Lakes is easily accessible on a day tour from most of the major towns on the Adriatic coast except maybe from Dubrovnik when you would need to either have an overnight stay or come back to Dubrovnik very late. A Plitvice Lakes tour from Split takes around 3 hours each way, a day tour from Zadar to Plitvice Lakes takes around 2 hours, and a day tour from Zagreb the same.